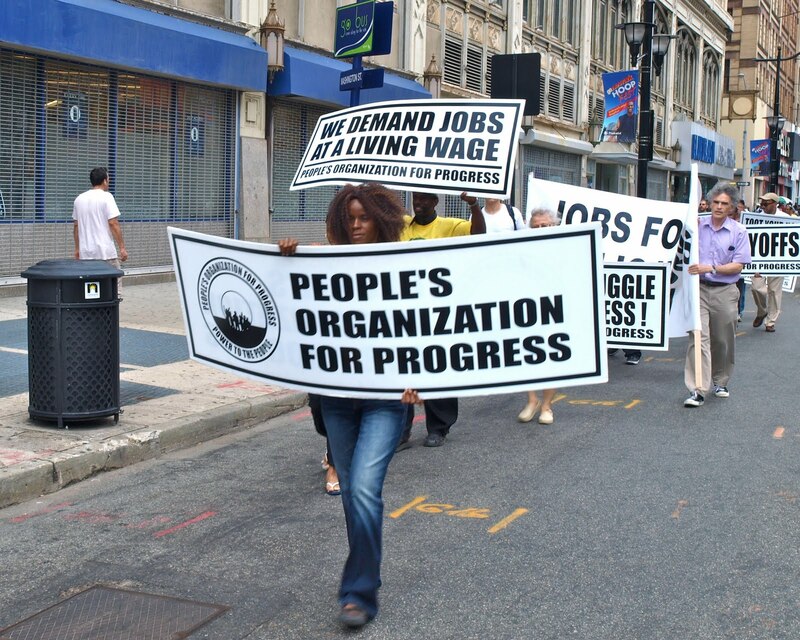 On Monday, September 5, the People's Organization for Progress marched and rallied for jobs in Newark, NJ. Though this was a special Labor Day event, it was also the 71st day of POP's "Daily People's Campaign for Jobs, Equality, Peace & Justice," which began this past June 27 (see POP Begins Daily People's Campaign for Jobs, Peace, Justice & Equality, and People's Organization for Progress "Daily People's Campaign," Part II). As Larry Adams, N.J. 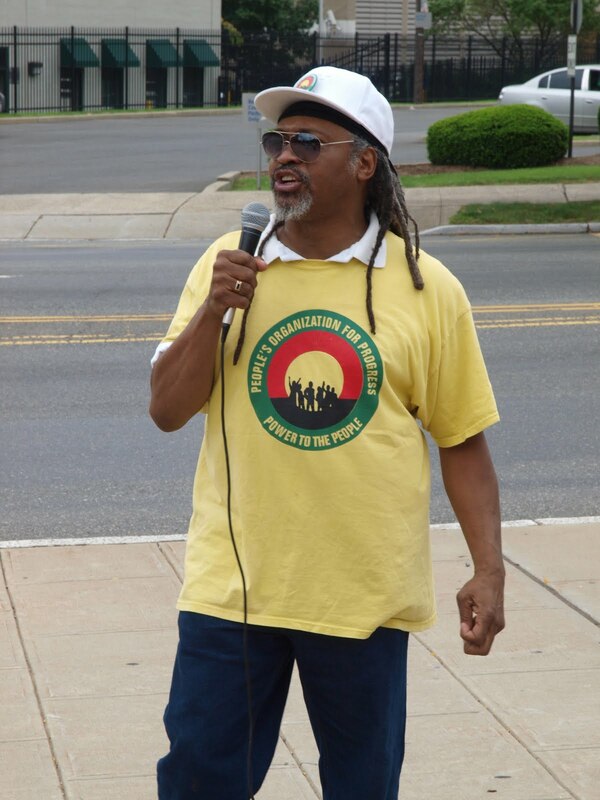 POP's vice-chair for external affairs observed, "around the world, workers celebrate Labor Day on May 1st." "A September 'Labor Day' celebration is nearly unique to the United States," he continued. "the US capitalists want us to celebrate with beer and cook-outs, to forget labor's struggle for a better world; but we chose to use today holiday to demand jobs at a living wage!" 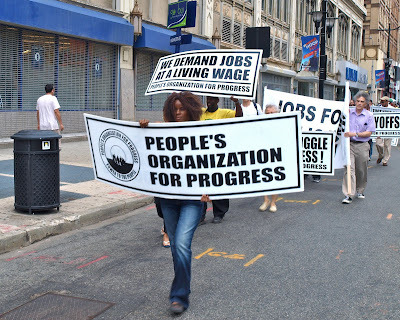 her job, meeting POP, and joining the "Daily Campaign"
Or, as Lawrence Hamm, chairman of the People's Organization for Progress put it, "there are more people unemployed today than during the Great Depression. Currently we are one percentage point away from what is officially called 'depression-level' unemployment. We need a 21-century WPA (Work Projects Administration, the Roosevelt-era government body that many hold responsible for lifting the US out of the Great Depression)." 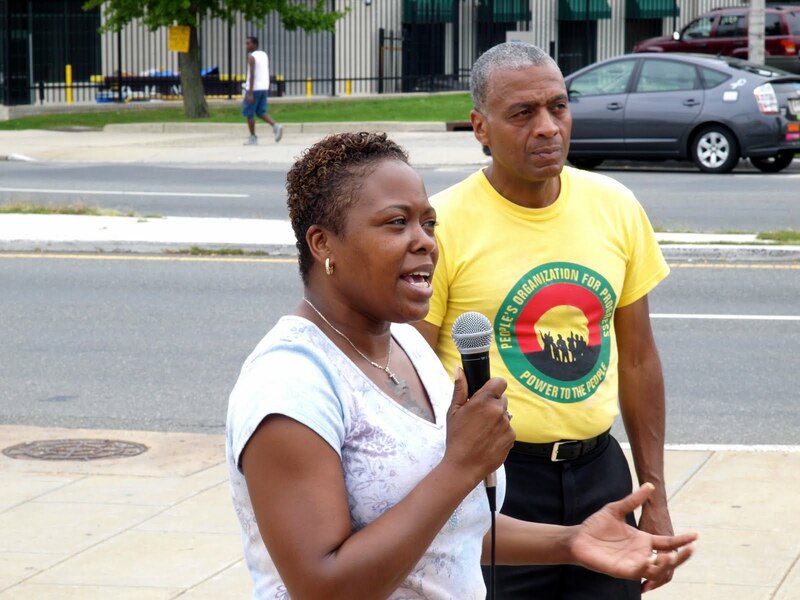 Unfortunately, though a significant number of churches and labor union locals came forward over the last two weeks, these organizations did not participate in any serious numbers. 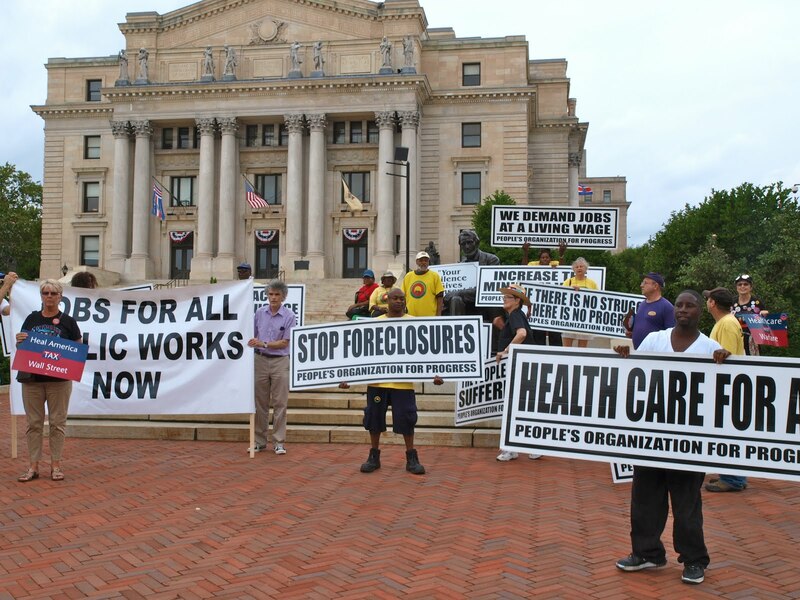 Union workers from Rutgers University, Newark Teachers, and SEIU 1199 participated as individuals. 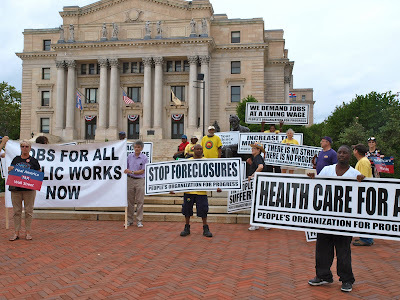 While the NJ Industrial Union Council was represented (and promised to bring out its membership one day a month for the Daily People's Campaign), the majority of participation came from community groups. Newark City Council member-at-large, Mildred C. Crump, was the only government official who attended. Labor Day, with its backyard barbecues and Local Union cookouts and parades, is a day that doesn't lend itself to mass action. For those who rallied at the courthouse and marched downtown from there to the Broad & Market and back, it was the best People's Daily picket yet. The loud and boisterous honks of support from passing motorists more than made the day. Perhaps the most exciting recent development in POP's relations to the labor movement was Larry Hamm's speaking engagement to the Bermuda Industrial Union's Labour Day Banquet this past Friday (click on the banquet link for a news report from Bermuda's Royal Gazette). 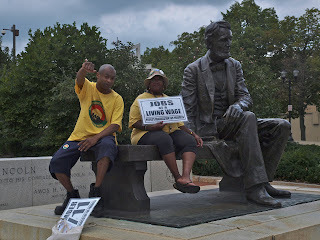 To view additional photos from the Labor Day march & rally (and a special thanks to my friend Jon who snapped these shots), click on this photos link.